Happy Kitchen Sink Stamps Monday, thanks for stopping by today! We have two neighborhood squirrels this year, I've been enjoying them coming up on the front porch, but the dog, we'll he's not so happy with our newest visitors! Sometimes I think the squirrel purposely hangs out just to bother him. Today my projects feature stamps from Kitchen Sink Stamps 3 Step Autumn Squirrel and the Owl & Autumn Moon sets. I'm also excited to share with you that complete directions for these projects can be found in the December issue of Crafts 'n Things on page 46. Remember you can save 10% on all your Kitchen Sink Stamps purchases when you click here then enter code LISA10KSS. Fabulous nutty cards! Love the warm rich colors and the leaves flowing off the side is beautiful. Beautifully done, Lisa!! 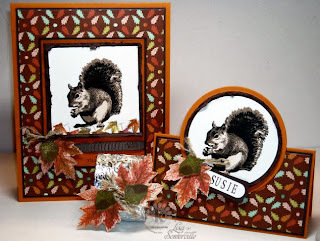 Beautiful squirrel images and designer paper is just perfect for this wonderful project! Just beautiful! And I love your color combo for the squirrel! Oh wow, Lisa! This is just so beautiful! Love this wonderful set!! I saw your card in the magazine this weekend! One of the gals at the class brought it in to share with us when she saw it! Congrats!! Stunning projects Lisa! Love the little critter and again you have used such gorgeous papers! Now the poor dog is probably concerned that Mom is going to feed the visitors some of his treats!!! Love the squirrels! Perfect fall palette too. Such a gorgeous set you've created. 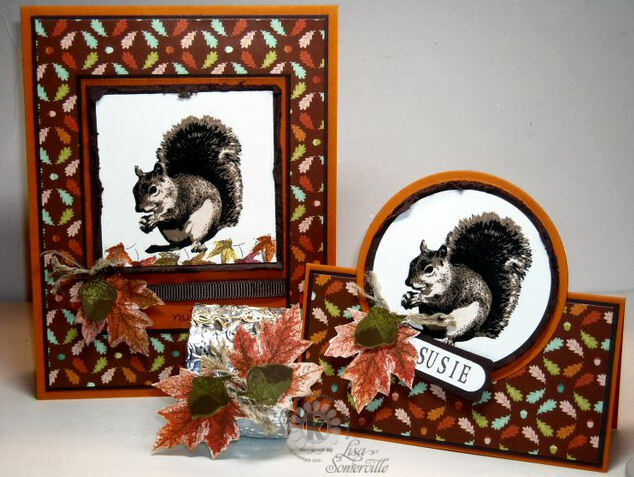 What a beautiful collection, Lisa...love the fall theme for sure and the design is terrific! How awesome is that!! I love your sensational napkin ring and place card using these gorgeous autumn images!! And a beautiful matching card, to boot!! What an amazing celebration table you will have with these stunning pieces!! So remarkable, Lisa! What an adorable set you've put together! LOVE it! These stamp sets are blowing me away!! What a clever idea to layer parts of the images. I love this fall theme on this one, the colors are so warm! Have a blessed week!